The definition of a prose poem remains elusive. People argue about whether the prose poem can indeed be considered a poem, since it abandons the art of the line. 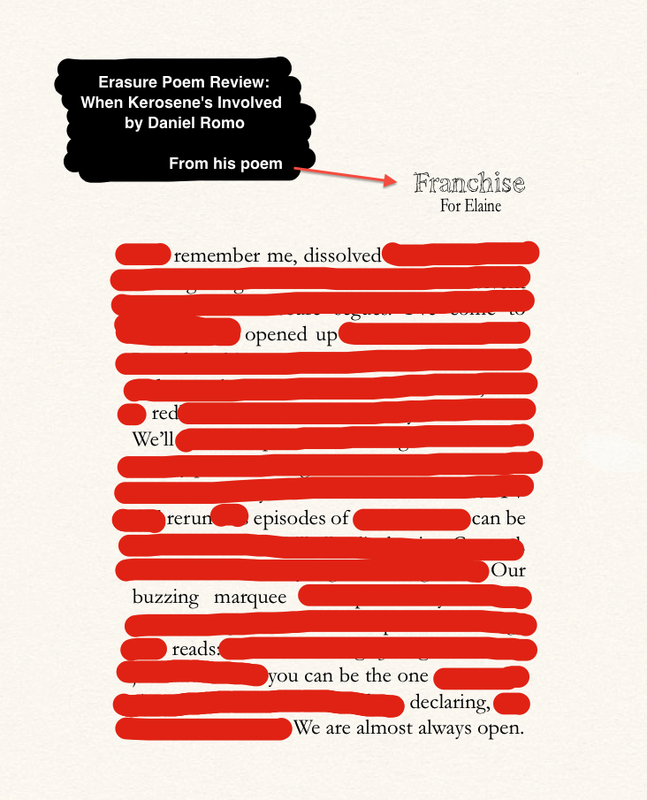 Daniel Romo’s debut collection of prose poems When Kerosene’s Involved disproves this argument. Laden with brilliant imagery, alliteration, and consonance, this collection lights a fire that never quite extinguishes itself. I got C’s throughout high school and relied on Cliffs Notes. There was nothing about mourning. It’s in this last line that the reader learns where the fire begins. Prose poems are mystical. They work against form. The skill is in the compression of language, and for Romo, this task seems effortless. His poetry possesses an aura of impersonality and wit, and it effectively revisits themes of identity, or mis-identity, and loss without being redundant or too sentimental. Comic relief arrives by way of writing exercises or logic problems as well as other poems that mix pop culture spanning generations from Casablanca to The Little Rascals to Kool and The Gang to The Young and the Restless. It makes for a good case of nostalgia. In his introduction to The Great American Prose Poems: From Poe to the Present, David Lehman writes that “the prose poem is poetry that disguises its true nature,” and it is here the reader finds a telling parallel between the form of the poems in this collection and its speaker. He longs to be someone else, and “worship[s] childhood idols.” He stars in spaghetti westerns, yearns to be Danny Romalotti, the soap opera star, and later admits he’s “studied the science of forgetting ourselves.” Zorro even makes an appearance. Why the nostalgia for our childhood heroes, the longing to be them? Perhaps it’s his inner self wanting to be noticed, to matter outside of himself. It’s his wanting not to be alone. involved. Remember the scent of feathers singed. Fire destroys, but fire banishes darkness. It’s also known to symbolize desire. 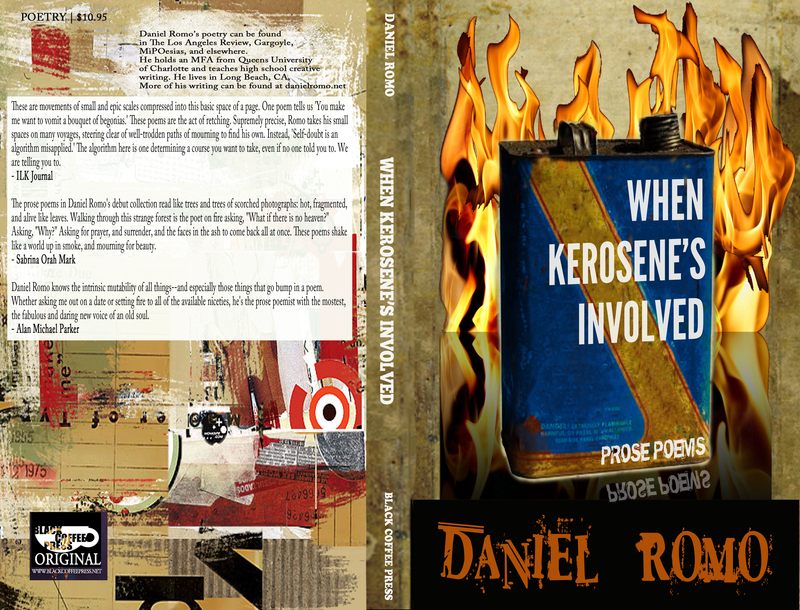 Daniel Romo’s When Kerosene’s Involved is filled with questions that long to keep burning, and as the line goes in his poem “North,” “where there is fire, there is hope.” This debut book is a hopeful collection indeed. Andrea Beltran lives in El Paso, Texas and moonlights as a poet. Her poems have recently appeared in Blood Lotus, caesura, and Pyrta. She’s the web editor for Referential Magazine and blogs about poetry and writing at http://andreakbeltran.wordpress.com. This entry was posted in Book Reviews and tagged Andrea Beltran, Black Coffee Press, book reviews, Daniel Romo, prose poems, Sundog Lit, When Kerosene's Involved. Bookmark the permalink.